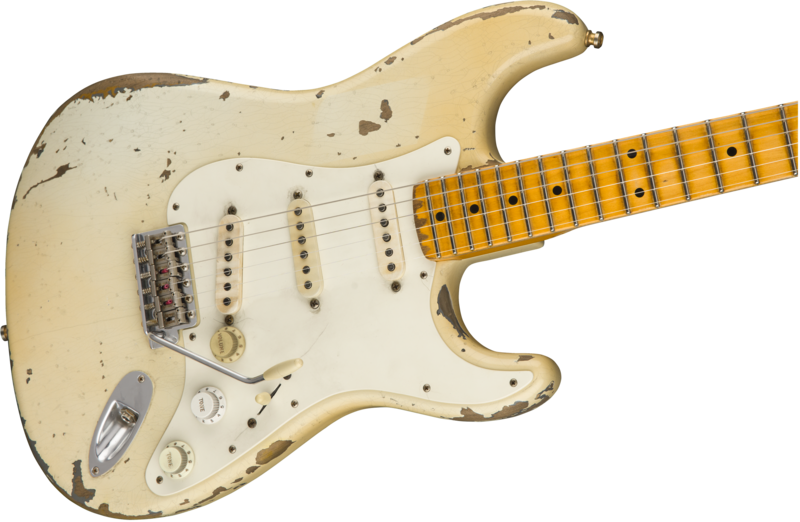 Honoring the legacy of two of the most influential Texas blues guitarists, the legendary brothers, Jimmie and Stevie Ray Vaughan, Fender Custom Shop proudly presents the limited-run Vaughan Brothers Two-Stratocaster® Set. Limited to 30 sets and crafted by Master Builder John Cruz, this pair of guitars faithfully recreates every detail of the historic instruments the brothers used to carve their place in music history. 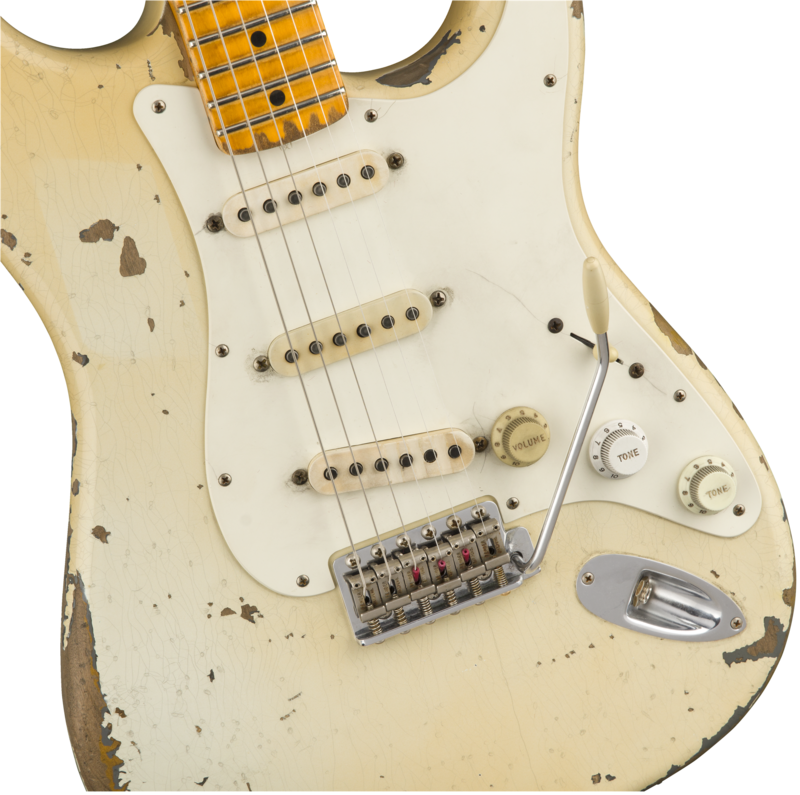 In the late ‘70s, Jimmie Vaughan bought his first White Strat from a friend for the sum of $245 and proceeded to customize it to suit his needs. The Mary Kaye-inspired modifications include a late-50’s neck with a thin profile and constructed from a lighter maple. 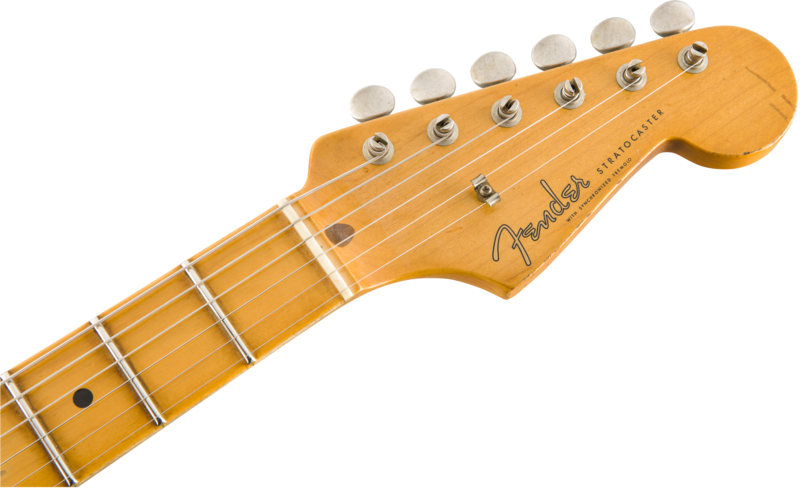 Charley’s Guitar Shop in Dallas branded the headstock with a new Fender decal and installed larger frets to cater to Jimmie’s effervescent playing style. While on tour in Denmark, Jimmie adorned the back of his guitar with an upside-down pin-up girl who emerges right-side-up when the guitar is played behind the head. Retired from stage and studio, Jimmie’s Strat is currently in Austin, with his late brother Stevie Ray’s Strat---a proper tribute to the Family Style duo. Master Builder John Cruz spared no effort to recreate this blues guitar classic that Jimmie proudly describes as a hotrod race car, customized beautifully to his specific tastes. A spitting image of the original, the two-piece, offset-seam alder body bears a Relic® lacquer finish and is loaded with hand-wound Custom Shop single-coil pickups and three-way pickup switch. The one-piece 5/4 flatsawn maple neck sports a custom “ ’57 C” profile, 9.5”-radius fingerboard and 21 #6100 frets. 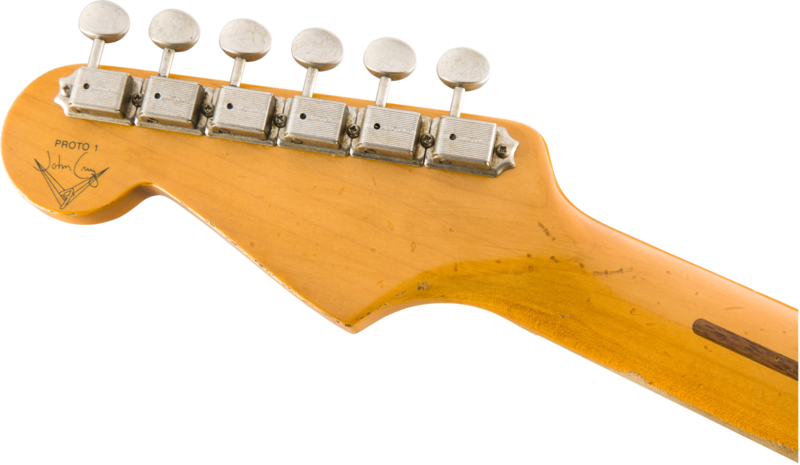 Other features include a 1-ply Parchment pickguard, American Vintage synchronized tremolo bridge, vintage-style tuning machines, bone nut and wing string tree. Includes deluxe hardshell case, strap and Certificate of Authenticity.